In a large mixing bowl, beat heavy whipping cream. Start on slower speed to avoid splattering, then change to high speed as the mixture thickens. Add powdered sugar early-on while mixing. When tracks from the beater begin to appear in the cream, watch carefully as whipped cream will thicken quickly at this point. You should be able to make peaks in the whipped cream that do not collapse. Do not over-mix as whipped cream will get grainy. If you continue to mix beyond the peaks and grainy point, the whipped cream will suddenly separate and become butter clumps in buttermilk. 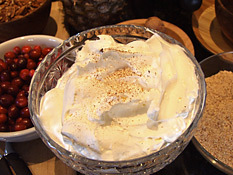 whipped cream tops off and rounds out your desserts and your hot coffee or cocoa. Serve this in a simply-elegant bowl. Use cold cream and a clean, cold mixing bowl and beater. Plop the whipped cream into a serving bowl so it has a natural shape of peaks. Don't "design" it with your scraper or spoon. Use a glass or porcelaine bowl to serve (nothing pourous like wood. Grate just a tiny bit of Nutmeg on top for color and texture.